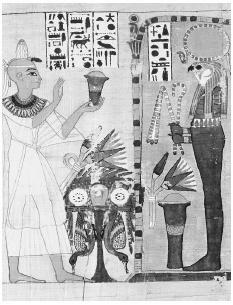 Departed souls make an offering to Horus in this illustration from the Egyptian Book of the Dead. Such images have become more widely known than the text itself. mortuary culture was not only to ensure survival after death but to preserve one's earthly station, presumably as a member of the elite. Therein lay the elaborate nature of Egyptian tombs and burials, which were intended to provide the deceased with a comfortable material existence in the next world, an existence that would in part be an idyllic version of earthly life, an Egyptian Elysian Fields. Egypt, the land of the living, was well ordered and governed under the principle of Ma'at, that is, roughly (rightful) order or universal guidance. Maat prevailed in the coherent, cosmic universe.